The U.S. government and other stakeholders investing in strengthening social service systems for orphans and vulnerable children can assess and monitor the difference they are making in sustaining government systems. Globally, strengthening a social service system is recognized as a logical and effective step to improve the efficiency, quality, and sustainability of the services the system delivers. Investments in system strengthening by the U.S. President’s Emergency Plan for AIDS Relief (PEPFAR) ensure the effectiveness and sustainability of PEFPAR’s efforts to prevent HIV and link HIV-positive children and their caregivers to testing, care, and treatment. MEASURE Evaluation—funded by the U.S. Agency for International Development (USAID) and PEPFAR—developed the framework presented here to fill part of the gap that exists in demonstrating the impact that system strengthening has on children’s outcomes, by providing indicators and guidance for measuring system performance. The framework is intended to support governments as well as PEPFAR implementing partners and other stakeholders in monitoring and evaluating system-strengthening efforts. These indicators measure the outcomes of system-strengthening interventions in five core areas, defined by PEPFAR as the components of social-service system strengthening: (1) leadership and governance structures; (2) the social service workforce; (3) financing; (4) information management and accountability systems; and (5) coordination and networking mechanisms. This document defines these indicators and offers guidance to apply them in a country or program. The National Social Service Systems for Orphans and Vulnerable Children: Framework for Planning and Monitoring and Evaluation describes indicators, indicator definitions, and a process for applying the indicators to assess, monitor, or evaluate social-service system strengthening efforts. Included in this document are useful processes and tools to adapt the indicators for country-specific context and a process and checklist for applying the indicators and using the results for decision making. As data are collected by means of a workshop, key informant interviews, or analysis of other data, they will need to be stored in a management tool. The purpose of a data management tool is to consolidate all data for easy access, verify them, and maintain them in a secure location. We developed an Excel-based data management tool for the storage and use of data related to this framework. 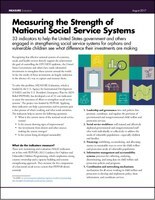 This fact sheet gives an overview of the 33 indicators for measuring the strength of national social service systems including background, what they measure, why they are needed, and how they were developed.